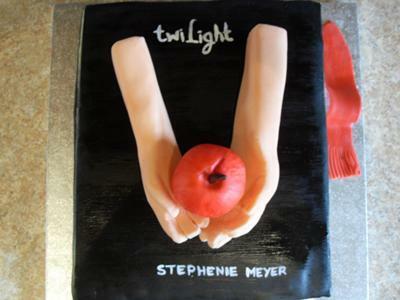 I was asked to make a cake the same as the twilight book for my hairdresser. I looked at the pictures on the internet and decided that I would do the book with 3D hands. To make the cake I used a 10" square tin I made a plain sponge for the book and cut it in to a book shape. I filled it with butter cream and jam. I covered 3 sides of the cake with white icing and marked in the groves to make it look like pages. Once this icing had started to set I covered the rest of the book with black icing over lapping slightly to make the book shape. I wrote on the cover as it was on the original book cover. For the hands I colored white sugar paste with flesh color paste and shaped them in to hands. When making the shape I used my own hands cupped so that I could see how they would sit together. They were held in place with toothpicks and edible glue to fasten them to the cake securely. The apple was made from marzipan and painted with red food coloring this was then attached to the hands with glue and a cocktail stick right through the apple, hand and book. The book mark was made just using a spare piece of red icing and just sat on the board in its snake like shape. That is AWESOME! Great job!!!!! !